Quartz is by far the most common and well-known of all crystals. In addition to clear (rock crystal), amethyst, smoky, rutilated, and citrine are varieties. Rose quartz is also in this family, but it tends to form clumps rather than crystals. These crystals are found in almost every part of the world, with major deposits in Arkansas and Brazil. All quartz contains silicon dioxide, but coloring is created by small amounts of various minerals incorporated into the crystal matrix and/or some natural radiation. The purple of amethyst is due to the presence of iron. Citrine also has traces of iron as well as some radiation. Rutilations are formed through the presence of titanium oxide. Aluminum, lithium, and the influence of radiation cause the darker color of smoky quartz. The pink of rose quartz is due to aluminum and iron. Although size is not the only determinant, it certainly plays a part. In general, larger crystals will generate and radiate more energy for love, peace, harmony, and healing, and therefore are very useful for meditation and grids, as well as creating all-over feelings of well-being in the area in which they are placed. I also use rock clusters for both generating large amounts of energy and charging other crystals. I simply place these on top of the cluster for a few days. I also keep both a clear and smoky crystal ball on top of a large cluster continuously, only removing them for meditational purposes. The clear light of rock crystal facilitates seeing things as they are, without distortion or coloration. Approaches can then be crafted to resolve difficulties. Its forces can be focused to help energize a person, situation, or physical space. I have a rather large number of rock crystals placed indoors on window sills and shelves, and outside in garden, compost, and planting areas. In addition to reflecting the radiance of the northern New Mexico sunlight, they help balance energy and maintain harmony. Citrine is associated with the mind, and the ability to think and communicate clearly and effectively. It is also useful for overcoming feelings of tiredness, or even exhaustion, freshening the mental faculties. It is useful for activities such as writing and public speaking. I have two rather large citrine crystals placed just beneath the front of my computer monitor. One is a very clear cathedral shape, and the other is a darker gold, double-terminated, and almost water clear, quite rare for citrine. Their energy helps enormously in my attunement to and writing about astrology, crystals, transformation, and the mystery tradition, and in delineating my own experiences. I also use mid- to large-size citrine elestials whilst meditating, especially for focusing on particular issues and seeing things from a different perspective. They are also helpful in stilling the mind, and allowing a deeper knowingness to emerge. Amethyst is connected with the process of synthesis and integration, bringing together seemingly disparate ideas and energies into a cohesive whole. Its purple color, the result of mixing together red and blue, symbolizes balancing use of the will with respect and tolerance for others and the situation at hand, seeing the larger picture as opposed to only the fulfillment of one's desires. I have both amethyst clusters and single points placed strategically in my living situation. They help in focusing attention upon seemingly paradoxical and conflicting ideas and perspectives, welding them into a cohesive wholeness. One caveat relative to amethyst is to keep it completely out of direct sunlight, as this will bleach out the violet color quite quickly. Same with citrine. Smoky quartz is especially useful for grounding and connecting with the Earth. It also facilitates the transforming of deeply buried feelings and emotions, allowing them to rise into consciousness to be faced in new and creative ways. I have a relatively few but powerful smoky quartz crystals that are of great assistance in keeping things grounded, including myself! They are wonderful transmitters of transformational forces emanating from deep within both the human psyche and the earth. Most of my smoky quartz crystals are elestials, which you can read about here. Rutilations are mostly golden in color, although they can also be blue. This reflects the power and energy of the Sun to nourish and heal both ourselves and others, and can bring joy into life and situations. I have four or so placed on sunny window sills to reflect the rutilations, and even a rare smoky rutilated cluster, which is a recent acquisition. They seem to help with maintaining positive and cheerful attitudes and outlooks, bringing a bit of sunshine into even the most stormy days. The golden sunlight reflected by the rutiles is very uplifting. Rose quartz is connected with love and the heart, and assists in making deep connections with oneself, others, and the environment, It is also related to circulation of the blood and overall health, and is very useful in any kind of healing process. Quartz crystals can sometimes take on the energies and qualities of the place where they were found. 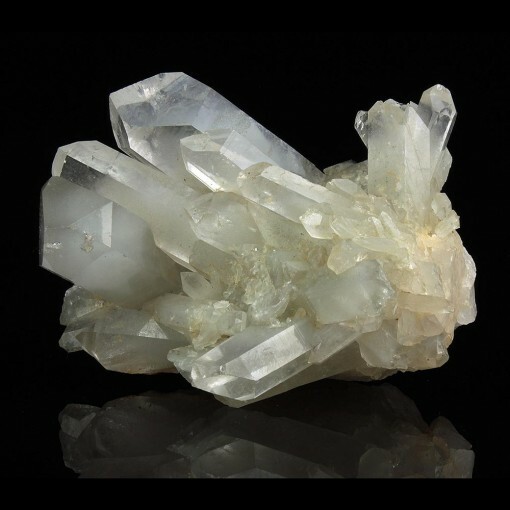 Arkansas quartz is usually the clearest of all, and the presence of healing mineral hot springs in that area have strongly influenced the effects. Tibetan quartz comes from very high altitudes, and can facilitate additional clarity due to the rarefied air at such elevations. And for many centuries, their exposure to the Tibetan Buddhist culture may assist with meditation. Some crystals appear milky, due to water vapor and other inclusions. This often indicates a softer, more yin force flowing through them. I have a few of these from the Andes Mountains. But as always, it is your own experience that counts more than the words of others. Take time to be with a crystal, and trust what happens. Note: Unfortunately, due to supply-and-demand and the unscrupulousness of certain dealers, a number of crystals on the market are not natural, in that they have been artificially heated or irradiated to change their color. This is especially true for citrine and smoky quartz, and for turquoise as well, which is often dyed. So be sure to buy from honest and reputable sources such as Majestic Quartz. © 2013-2016 Merlin Emrys. All Rights Reserved.